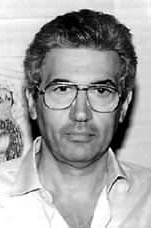 Sergio Martino was born in Rome on July 19, 1938. Since his family had long been involved in cinema and filmmaking (his grandfather Gennaro Righelli was a well known Italian director in the '30s and '40s, his brother Luciano a writer-producer), it's no surprise that Sergio chose the director's seat as a comfortable spot. Truly a helmsman of numerous genres, Martino's movies range from horror thrillers to spaghetti westerns to post apocalyptic rips to cannibal feasts. One of Martino's first forays into the world of filmmaking was working as a second level assistant director to Mario Bava on 1963's gothic ghost shocker The Whip and the Flesh. The end of the decade saw Martino's directoral debut with the 1969 documentary feature Mille peccati... nessuna virtù, while 1971 saw his initial horror outing with Blade of the Ripper. The first of several Martino gialli starring scream queen Edwige Fenech, Blade of the Ripper (AKA The Next Victim) finds a black gloved psycho with a razor terrorizing women in Vienna. Has the madman set his sights on poor Julie Wardh (Fenech)? A traditional giallo structure is here given good life by Martino, including a notably memorable ending. Similar enjoyable fare continued the same year with the pleasing giallo Case of the Scorpion's Tail. Italian horror regulars George Hilton and Anita Strindberg attempt to follow a cache of shady insurance money...with a mysterious killer always just nearby. Martino's next work of terror was 1972's beautifully shot All the Colors of the Dark. An atmospheric and weird horror starring dark haired lovely Fenech, All the Colors tells the story of distraught young Jane (Fenech) who finds herself mysteriously drawn to a cult of devil worshippers...and membership may be permanent. Clearly working well with Fenech, Martino cast her in his next thriller, Your Vice is a Locked Door and Only I Have the Key. Abusive writer Oliviero (Luigi Pistilli) takes his frustrations out on his poor wife by beating and tormenting her. But when a killer begins slashing locals nearby, is the frustrated Oliviero to blame? Also known as Gently Before She Dies - and based in part on The Black Cat by Edgar Allen Poe - Locked Door is a sprightly giallo well worth seeking out. Potentially Martino's best slasher/splatter pic, 1973's horror Torso is a real triumph of claustrophobia and suspense. After a loony begins killing local women, lovely student Jane (Suzy Kendall) and a group of college friends decide to get away and spend some time in a remote mountain villa. Only problem is: the psycho likes the idea of a vacation too - and so he follows the girls to their isolated retreat...with murder on his mind. A must see from Martino. Torso observes typical giallo conventions but possesses more than its fair share of standout scenes, including a great nailbiting limbs-a-hackin' sequence with Kendall and the killer. The latter half of the '70s saw the director involved with cannibals, fishmen and alligators. James Bond babe Ursula Andress led the cast in Martino's Mountain of the Cannibal God in 1978, while fellow 007 babe Barbara Bach starred in a pair of creature features, including Screamers and The Big Alligator River (both 1979). Although the early 1980s saw Martino working on a variety of comedies, the director wasn't done with horror just yet. In 1982, he completed the supernatural thriller Scorpion with Two Tails. The following year saw the boisterous 2019: After the Fall of New York, a post-apocalyptic actioner clearly geared to cash in on John Carpenter's Escape from New York. The remainder of the '80s and early '90s saw Martino steadily involved with television, where he continues to work to the present day. A chameleon director of real flex and versatility, Sergio Martino's strengths lie in his ability to work in almost any genre (horror, thriller, western, sci-fi) and infuse his projects with real energy.